Chocolate confetti squares are a super easy, retro dessert with only 4 ingredients. 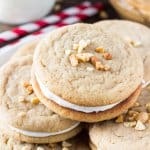 They’re soft and chewy with a delicious hint of peanut butter and sweet, fluffy marshmallow texture. A few months ago I shared my favorite recipe for Confetti Squares. 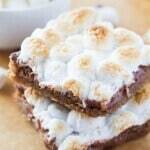 Sometimes you’ll hear them called peanut butter marshmallow squares, or butterscotch marshmallow squares. But however you slice it – they’re just plain delicious. So it was only logical to share the chocolate version. 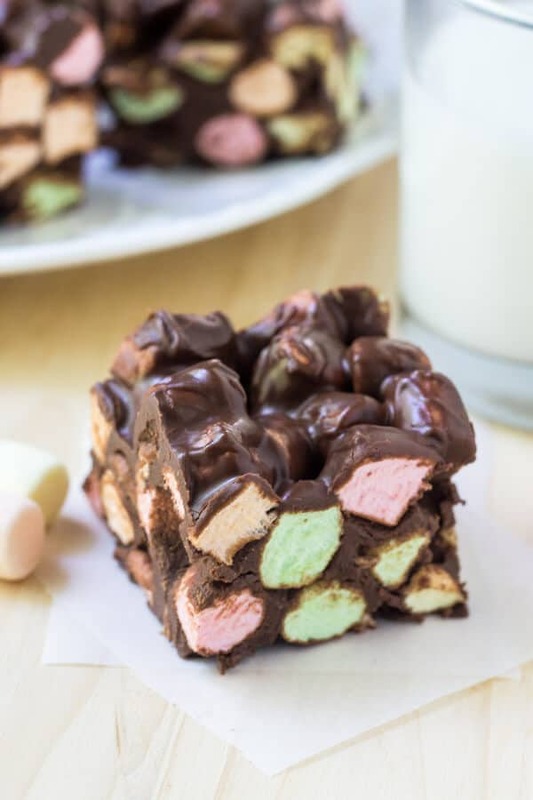 Enter Chocolate Confetti Squares. 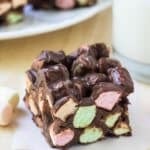 Chocolate confetti squares are these delicious, retro, no bake bars made with only 4 ingredients. Nothing fancy, just good old-fashioned sugary deliciousness. They’re sweet, chewy, marshmallow goodness with a delicious hint of peanut butter. And if you have a serious sweet tooth – then confetti squares are for you. 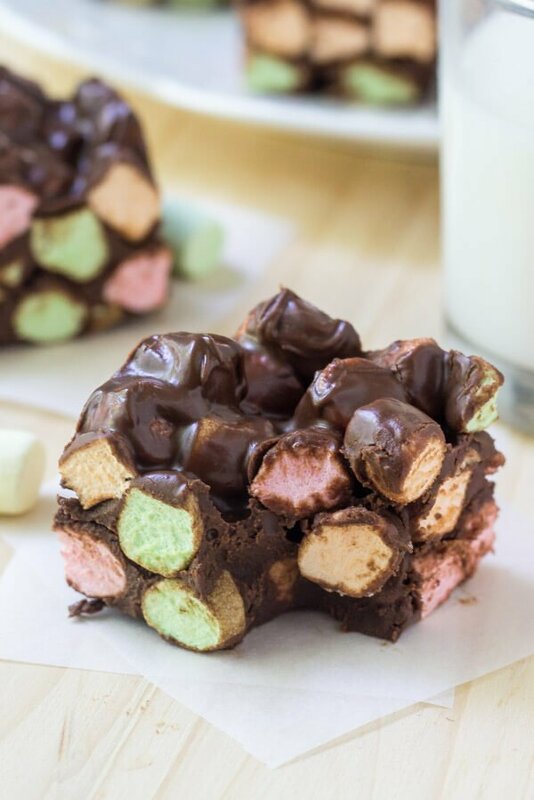 The recipe gets its name from using multi colored marshmallows. 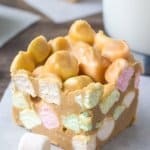 You could obviously use plain ones if you prefer, or if that’s all you have on hand – but the pretty pastel colors will make you think of childhood in the most fantabulous way. My grandma loved to bake and would always make us a ridiculous amount of treats. We’d go over to her house and there’d always be cookies, caramel popcorn, Nanaimo bars, and of course confetti squares. It was the best when she’d babysit us, because we’d get way more treats than when our parents were around. And so to this day, chocolate confetti squares always make me think of my grandma. 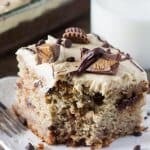 I hadn’t made them in years, but when I was thinking of favorite recipes to share here on Just So Tasty – the recipe obviously made the cut. To make the bars we first melt together the butter, chocolate chips and peanut butter in a saucepan over low heat. Go slowly here to avoid lumps and minimize the chance of burning. Then remove the mixture from the heat and allow to cool. This step is super important, or else you’ll melt the marshmallows. Then we stir in the marshmallows, pour the mixture into a prepared pan, and allow it to set in the fridge for a few hours until it’s hardened. As much as children love these bars, I’ve never seen a grown up turn them down either. The hint of peanut butter, delicious chocolate, and chewy marshmallow texture makes them impossible to resist. And if you’re looking for a super easy, no bake recipe – then these chocolate confetti squares are the perfect recipe. 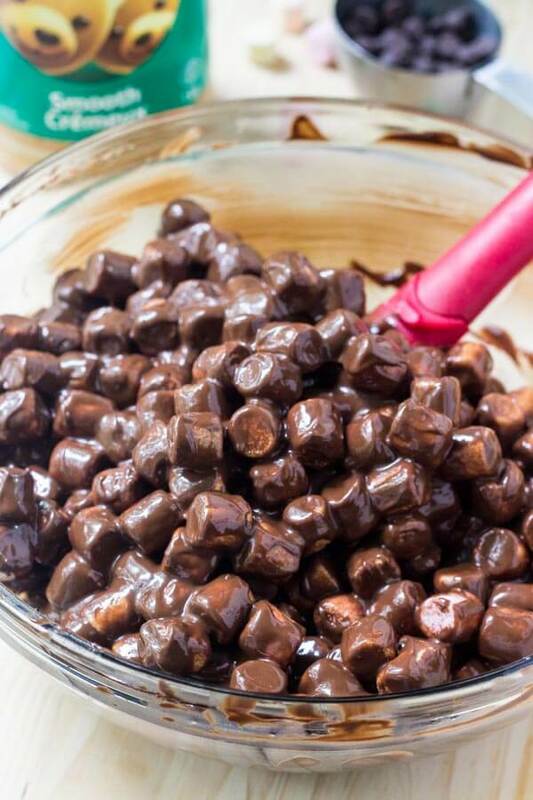 Make sure to try these other no bake favorites! 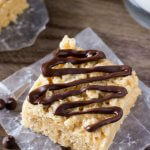 Chocolate confetti squares are a super easy, retro dessert with only 4 ingredients. They're soft and chewy with a delicious hint of peanut butter and sweet, fluffy marshmallow texture. Line an 8x8 or 9x9 inch pan with aluminium foil and lightly grease, or line with parchment paper. 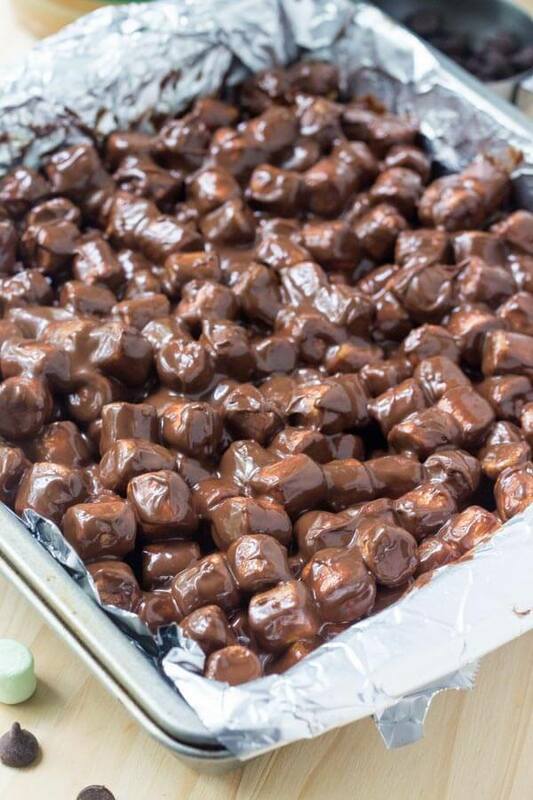 In a medium sauce pan over low heat melt together the butter, peanut butter and chocolate chips. Stir occasionally. Once the mixture is no longer hot, stir in the mini marshmallows. (If the pan is still hot, the marshmallows will melt. Pour into the prepared pan and allow to set in the fridge for 2 hours. My grandma used to make these for us all the time – but I lost the recipe. Thank you so much for sharing!